Both are very moisturizing and pigmented. Satin Plum is obviously a purple shade. This color is a pearl finish giving your lips a nice frosty flush of color. Perfect for the fall. Primrose I absolutely am in love with. 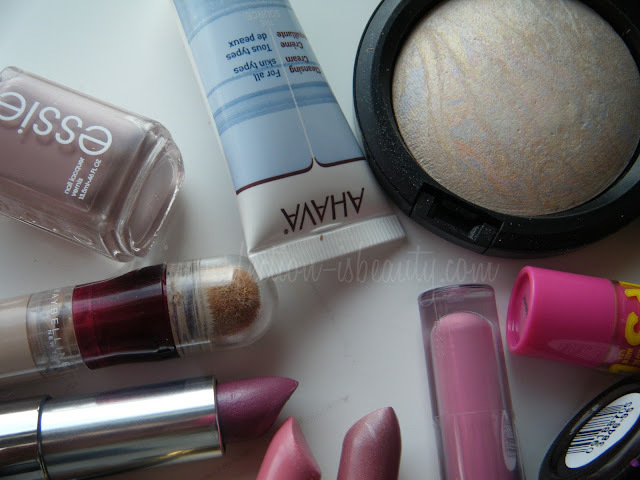 It is a great alternative to my usual light nudey milky pink lipstick. A very flatter color. This color is a cream finish and I find the cream finishes lasting power is amaz for drug store lipstick. This I've been looking for ever since I seen it once at the drugstore and thought I didn't need it. Well although, I didn't "need" it I still lost sleep thinking about it and I NEVER could find it again. *figures right* Well I finally got my hands on this and I'm actually pretty excited about this product. The lasting power on this baby is crazy. I swatched it on my hand the day I got it and I was literally scrubbing it off my hand, and it wasn't coming off. The color is divine, its the most stunning berry mauve color I"ve ever seen. It is a matte finish which generally I gravitate towards. Although, it applies very different. It is a little drying to the lips, but nothing a little balm, or gloss couldn't fix. I didn't even no these existed. These are more of a tinted lip balm/butter. It actually applies like butter. It smells just like Cream Brule. These are super moisturizing, and very pigmented. They are a little pricey for a drugstore lip balm, but totally worth it, and the packaging is just so feminine I love it. It claims it will help improve your lips, and I've actually noticed them being a lot more softer. This is the perfect fall shade for me. I've been reaching for this color a lot this past month to really add that berry fall purple lip. Nothing to dramatic. I'm tip toeing my way more into the darker shades. Very pigmented. Not as moisturizing as the Revlon lipstick but I still really love it. This is the perfect product for on the go. Its very easy to apply, don't have to worry about touch ups and really gives you a nice pop of color without hardly trying. I've been loving this, and the Revlon Lip Butter on days I go to school so that I don't have to worry about touch ups, or having a to look in a mirror to apply it. This and Essies Lady like I've been alternating on my toes. I've used this a few times on my nails but majority of the time its been on my toes. Its a gorgeous black based polish with big chunky fuchsia and purple glitter. I did do a nails of the day post with it and Revlon's Starry Pink here. This is probably my all time favorite fall nail color. This one really is home run for me. The color looks in the bottle more of a mauvy, rose color but when applied to me it looks almost like a nudey taupe pinkish shade lol. Overall its so pretty, super opaque and very elegant looking. *Love this* I did do a notd post here if you wanna see what it look like on. I've never really been wowed by a concealer especially a drug store one, but this is one I've really been enjoying. Its so light weight feeling, and so easy to blend. They do have a decent color range to choose from. It has a micro fiber velvet sponge which I was a little leery about it being sanitary, but it applies still to this day just as it applied the first time I used it. I don't find it creasing, nor wearing off throughout the day. I do use a msf to set it, so I'm not sure how it wears not being set. These have really saved my life the past month. I've really not been in the mood to wear to much makeup, especially going to classes. I don't like to wear hardly any makeup if I do at all, but these have been a great no makeup look eyeshadow's. They are both matte and look so natural when applied. These are definitely could be buildable if desired however, I simply use it only for one reason and that being something easy, effortless and super quick to apply when on the go. This blush has probably been my most reached for this season. Its a gorgeous dusty rose color with a little sheen of gold to it. This blush is extremely pigmented so it does have to be well blended. A little goes a long way with this blush so you hardly have to apply any product. I've been using this everyday! Its an overall great metallic, frosty highlight. Looks so pretty when applied on top of your blusher, down your nose and my favorite under your brow bone. This was in my BirchBox last month and I absolutely LOVED it. I'm so happy I got this in my Birchbox. It doesn't leave that weird oily residue after you wash your face, and its super light feeling. Overall it really makes my face look and feel so clean. I will definitely be check out the full size of this. I actually forgot to photograph this sucker. I've been using this the whole month of October (not everyday but you know what I mean) It is probably one of my favorite self tanner products I've ever tired and I've tried quite a bit. It does give you a natural looking tan, and a very nice glow to your skin, and could be buildable depending on how often you apply it. I'm not looking to be dramatically darker, just a little color now that I'm going to be hibernating this winter and won't be getting as much sun. I keep meaning to pick up that Revlon polish and I always forget! Now you've made me want to try their lipsticks as well! 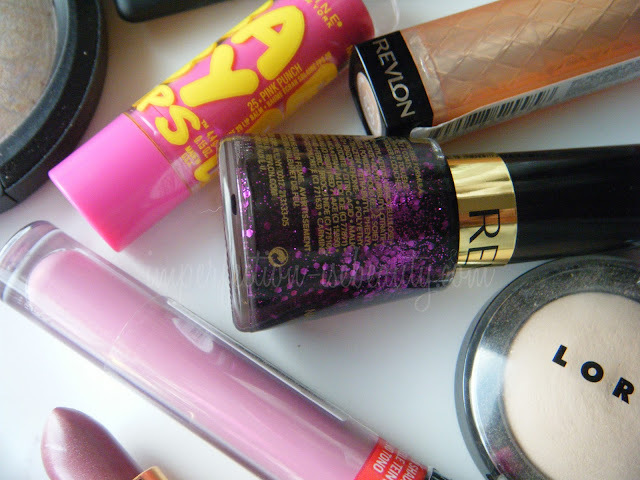 love all the revlon products! 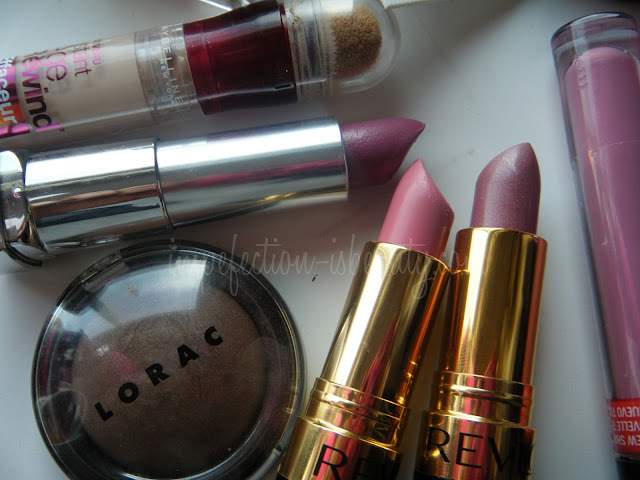 i am such a huge fan of all their lip products! 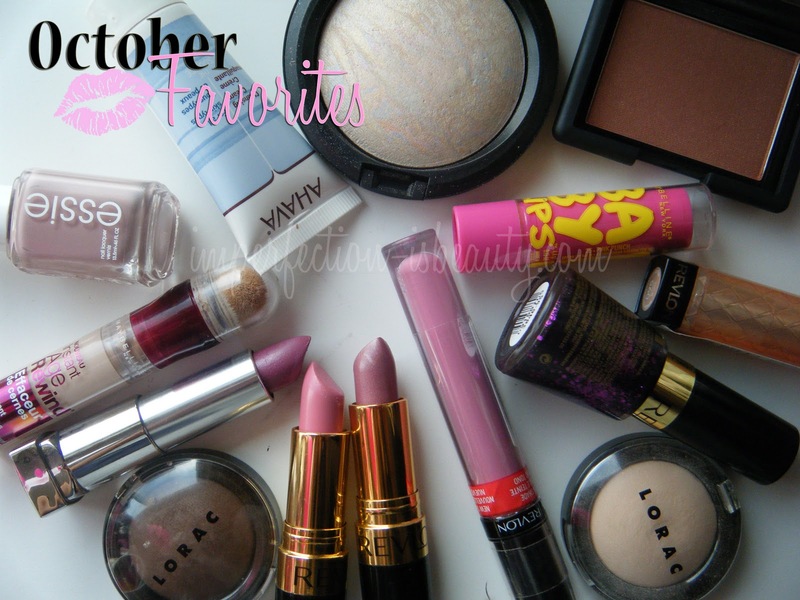 Great favourites hun, I especially like the look of the revlon lipsticks. Gorgeous colours. Wow! You have so many great products here and you just gave me a good shopping list!! lol. I def want that Revlon polish and both their lipsticks. There such pretty colors. I never knew maybelline and revlon made lip butters! Are these new? I've never run across. 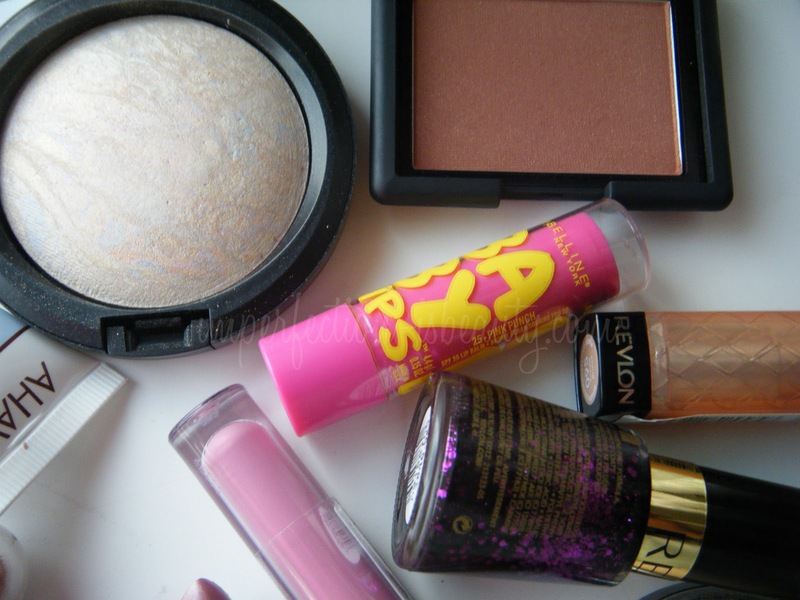 I'm totally getting Revlon Primrose tomorrow as it's on sale for $3.99 at Shoppers for the week-end, yey! I'm still looking out for the Revlon lip butters.. they're so hyped up! I hope I love them as much as everybody else does. @Mercades YOU SHOULD they're actually really nice. @Ariel I no isn't it. I like the butter better then the balm for sure. @Amanda I have been loving they're products lately. They're probably my favorite from the drugstore. @Rindodo np doll thanks for stopping by I appreciate it. @Kay not on me at all. Haven't had any problem what so ever and I'm at school for 6 hours straight. @Gaby I NO its one of my new favs for sure. we share a few of the same favorites! What great favorites, I think I might have to see if I can find some of the lipsticks you mentioned. I love pink lipsticks!